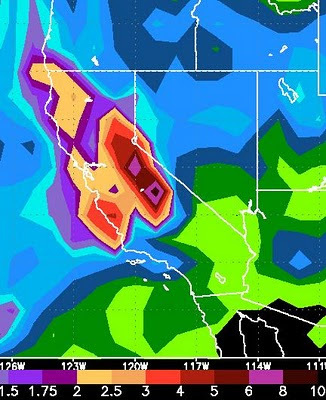 In the Central Sierra, the GFS weather model is forecasting over 10 inches of liquid precipitation. 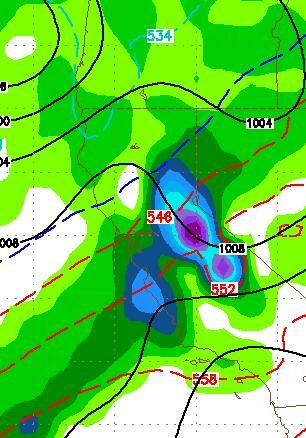 Most of Tahoe is in the 3-8 inch range and the Leeward Valley's of Western Nevada should pick up 2-4 inches of rain. These are staggering numbers. Currently, the NWS is predicting fairly high snow levels of 7,500 to 8,000 feet. However, the low dropping down the coast is bringing quite a bit of cold air to the party and I am hoping that those levels are around 6,500 to 7,000 feet. After Tuesday, the party aint over. I am tracking a couple of weaker storms that should move into the area on Wednesday through Friday. I will talk more about them in the next post.